I’m honored to join my wonderful colleagues the Rev. Jennifer Innis and the Rev. 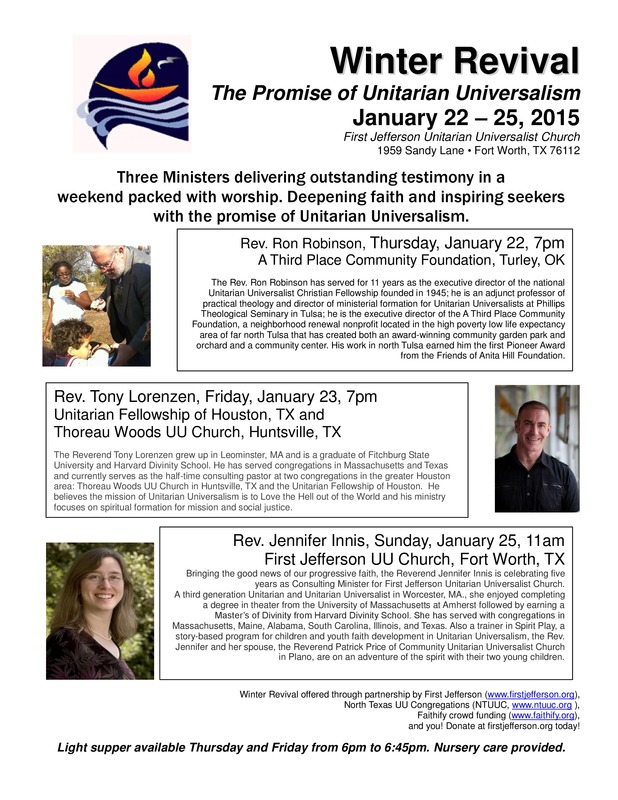 Ron Robinson in preaching a UU Revival at First Jefferson UU Church in Fort Worth, January 22-25, 2015. I will speak on spiritual formation for mission at 7 p.m. on January 23. Hello Rev. Tony, I’m surprised to read of this UUCF gathering. I’d like to know more. Is there a website with info? Is this the bi-annual UUCF Revival? I finally did get quite a batch of past publications from Ron Robinson. We had our first two gatherings in Dec, and another tomorrow night. (Live Oak UUC in Goleta CA.) there are three of us so far.